It’s not easy to see a series you love come to a close. It becomes more difficult when you happen to be traveling when that final chapter receives its worldwide release. The difficulties I encountered trying to obtain tickets to a Harry Potter screening in Brazil may make an apropos footnote in another post but here they serve the purpose of stating that: it was hard to say goodbye and therefore it seemed almost fitting that it was difficult for me to make it to my first screening of the film. While I stand by what I wrote in my series of articles entitled Keys to a Better Life as a Fanboy, hindsight has been beneficial in my viewing of the Harry Potter series; some have aged better than others but I believe, more so with this series than others, that the whole is truly greater than the sum the parts. Only now having seen it all can I truly see the enormity of the series. Whereas in each individual installment there was nitpicking to be done, or ignored, and the franchise became the Susan Lucci of my personal awards, The BAMs, now that it’s at its conclusion I can say it’s the greatest film franchise I’ve beheld. Now what of this installment, you ask? Firstly, the issue of cinematic bifurcation needs to be addressed. When Harry Potter announced they split the seventh book of the series into two films it became the thing to do. Twilight followed suit and it seems The Hunger Games will likely do the same and perhaps some others that I’m forgetting. Now I’m not naive enough to believe that the main motivation to do such a thing isn’t financial, however, there exists in this decision artistic possibilities and responsibilities: the possibilities being to cinematically craft as much of the adapted work as possible and the responsibility to make it vital. I also want to clarify that while there might not be the Shakespearean foresight to make a multi-part work such as Henry IV or Henry VI it also was not a decision made retroactively in the editing room so some jets need to be cooled regarding the split-finale phenomenon. All series of films have their own inherent logic and language and thus they develop their own shorthand and therefore the bifurcation becomes much less of an issue. This, of course, does not mean that you could walk in cold to Deathly Hallows, Part 2 and get absolutely everything (an example would be how quick and dirty the Polyjuice potion usage is in this film) but conversely I don’t want to be able to walk into the end of a series cold and be able to watch it without wondering what’s happening at some point because it usually means that at some point the integrity of the series has been compromised. So yes, this film does stand tall on its own as a self-contained piece of art with the above caveats noted. As the trend progresses other films will have this as a barometer as how to handle this adaptation phenomena. My feeling is that works which have distinct tonal differences in the beginning and the end, as this does, (going from foreboding progressing to all out chaos) will be more successful in pulling off this trick. What this film ultimately does is deliver the desired conclusion to this mammoth story in the desired fashion. The pace of the film can best be described as a slow but steady depression of an accelerator and a very slow release at the end, which for the narrative being conveyed is just about perfect. Mark Day, the editor who has been the unsung hero of the tail end of this franchise, does his best work in this film. He creates the best montage I’ve seen since Up and perhaps surpassed it. Much like the pace of the film the tone is also established immediately. In a fashion not dissimilar to the recent X-Men film the film opens with a series of tense, brilliantly acted interrogatory scenes. The heroic triad is immediately gathering information and plotting their next move. These scenes are also brilliantly and dramatically lit and also establishes the visual motif of camera movement which is not altogether foreign to Eduardo Serra and it just adds that much more tension and gravitas to all the proceedings. I try and avoid departmental punchlists replete with commentary but the production and crafting of this film make it such that it’s nearly impossible to avoid. Alexandre Desplat has quickly catapulted to the A-List amongst film composers and his work in this film is absolutely sublime, it’s omnipresent but not overpowering and over-accentuating the film, it’s there for the taking if you want it and if you listen to it in isolation it’s amazing but in conjunction with the imagery sheer brilliance. 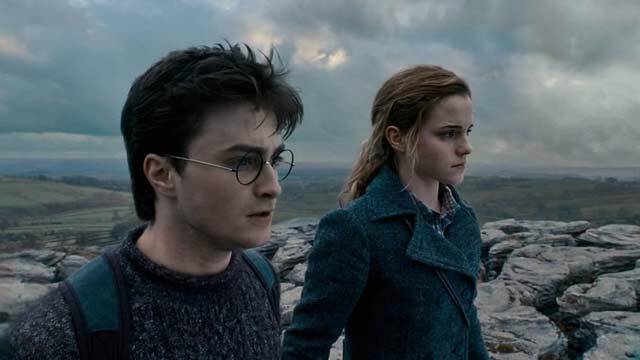 The Harry Potter films have also been through the years a bastion for lovers of ensemble acting, what’s most enjoyable about this film is that there are a number of paired scenes wherein the supporting players really get a chance to shine and have their moment and each one is more staggeringly great than the last. While I’d definitely contend that the Deathly Hallows, Part 1 was the showcase for Radcliffe, Watson and Grint, however, it should be noted that it is usually they who paired off with these supporting characters like John Hurt as Ollivander who here is pitch perfect and has more screentime than in the rest of the series combined. There’s also Ciarán Hinds who plays Aberforth. Warwick Davis, who does double duty as Griphook and Professor Flitwick, has a very tense scene as the former and is incredibly versatile. 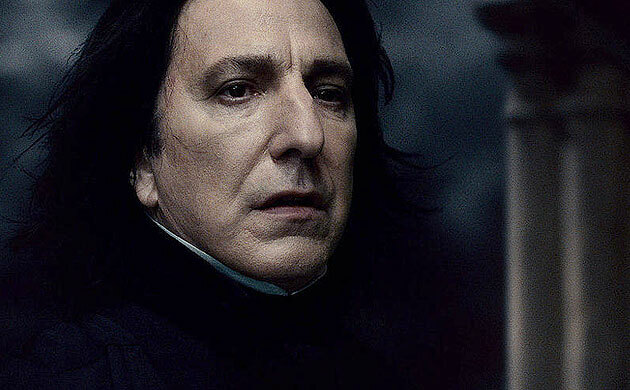 Then you also have among the supporting cast the incomparable Alan Rickman who over the course of eight films has steered his character unerringly along a very subtle and incredible arc. Perhaps what sticks with you most about the film though is the beautiful chaos of it all. The film does not bow down to the artifice of its artform and focus too singularly on any one tragic occurrence and just takes it all in as quick as one might in that moment. Some things just happen and you learn about it when characters do and you don’t know the how and the where just the result. It almost goes without saying that the effects are outstanding and are the best and most blended of the series. As for the 3D I have not seen it as such but I do want to and have heard that for a conversion it’s a job well done for a detailed summation of that aspect I’d point you towards CinemaBlend who does a great series about the 3D or not 3D conundrum. One of the barometers for the Harry Potter films, and for films in general, that I like to use is how is the ending handled. Now not that it’s a make or break but you do want the film’s last moment to leave a good, lasting impression. For example, I think that The Prisoner of Azkaban really dropped the ball with an ending that was tonally discordant when the darker chapters had just begun and a bit more restraint was needed. This film, however, ends perfectly and as I’d expected the epilogue was more effective on the big screen than it was in the book as it seemed to be created for the big screen. It is my assessment that Harry Potter is the greatest franchise I’ve beheld and it is to my delight and relief that it has concluded with the greatest cinematic chapter it has yet told.